The John A. Day Gallery is currently home to many pieces of art created by USD students, which range from printwork and paintings to sculptures and videos. The 30th annual Stilwell Student Awards Exhibition opened on Jan. 27 and will continue until Feb. 24. “The purpose of the Stilwell is to highlight USD art students,” said Michelle St. Vrain, interim director of the gallery. St. Vrain said each year they invite a juror to select from all pieces submitted by students to create an exhibition. From the pieces selected, the juror chooses which ones receive awards including best of show, honorable mentions, the Gladys Stilwell Freshman/Sophomore award, merit awards and the faculty award. Michael Petersen, the principal and founding partner 50,000 Feet, a creative agency in Chicago, IL, was this year’s juror. Petersen picked from 250 pieces narrowed them down to 105 pieces, St. Vrain said. Nickolas Baltz, a senior fine arts major with an emphasis in printmaking, was awarded best of show. Getting his piece selected into the exhibition and winning the $500 award was unbelievable, Baltz said, especially because he thought his piece seemed so simple. “This is what got me back into making and creating artwork,” Baltz said. Baltz looks at art as an outlet that he uses as a catharsis, he said. Art calms him and stresses him out, he added. 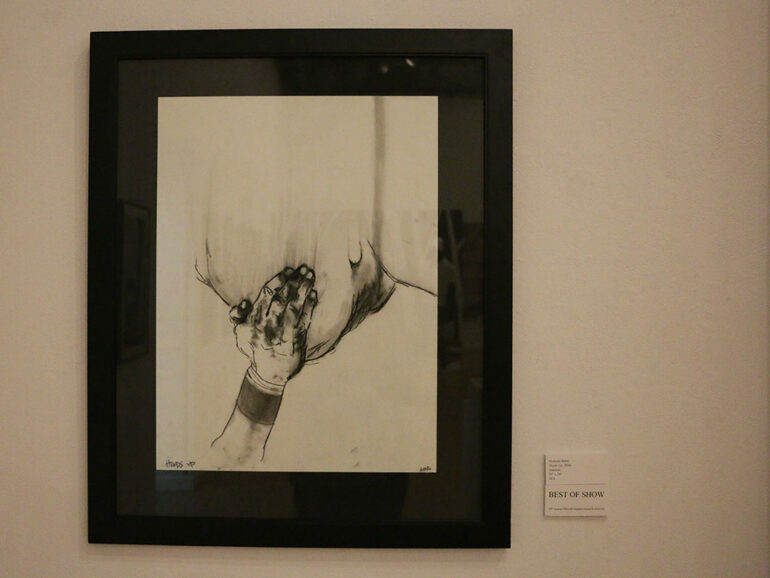 Dillon Bryant, a junior fine arts major with an emphasis in printmaking and photography, had three pieces in the exhibition and received a merit award for one of them. Bryant said he likes art because of the way it allows him to communicate. Bryant said the Stilwell exhibition allows students to show off their best work to a lot of people. This exhibition is also an opportunity for art students to sell their pieces. Keith Braveheart, a second-year graduate student, was one person whose art was purchased. Braveheart also won the faculty award, which came with a stipend of $100. He said if he could give advice to undergraduate artists, it would be to never take it for granted. Baltz encouraged other artists to do what they love and follow their passion. “I cannot stress enough for people to do the Stilwell and keep creating artwork,” he said.